Gospel music is a soulful, spiritual musical genre has its roots in black churches and blues music. There are a few key instruments that you will most likely hear when listening to this inspirational music. According to W.K. McNeil, the author of Encyclopedia of American Gospel Music, the tambourine is a very popular hand-held instrument that is often played by various members of a gospel choir. It is lightweight, held in one hand, and helps to keep the beat. According to the North by South project, a study of African American history and migrations at Kenyon College, the organ, a piano-like keyboard that pushes compressed air through pipes to create sound, is a staple of gospel music. In addition to the organ, regular pianos are played to make gospel music. These instruments are often used to accompany the words of slow gospel songs, especially when it is a solo backed up by the choir. Drums provide the beat for churchgoers to clap to when listening to gospel music. 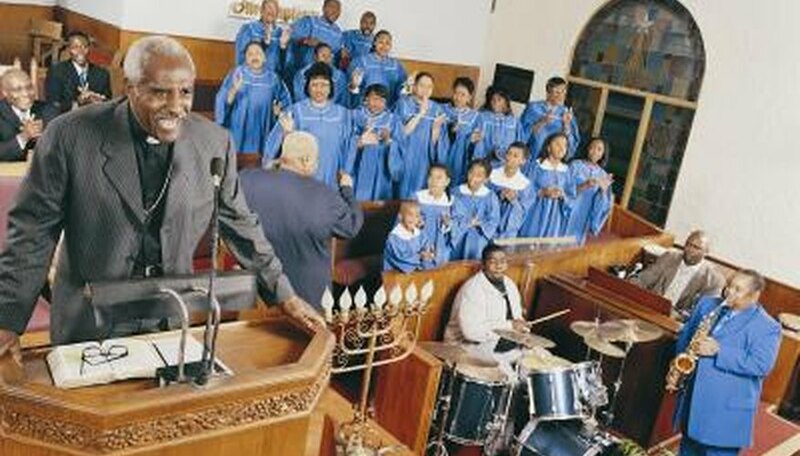 Like other black music forms, gospel music has its roots in Africa, where drum beats are popular. Many gospel bands will have a bass guitar player. This instrument is often used because gospel music is closely linked to the blues, and has very soulful tunes, which lend themselves to the guitar.